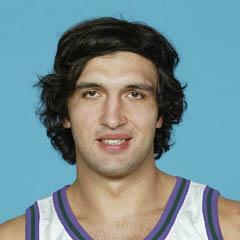 Zaza Pachulia (born in Tbilisi, Georgia on February 10, 1984) is a professional basketball player in the NBA. He was a very successful basketball player at a very early age in Georgia. Zaza was approximately 6 feet 8 inches (2. 08 meters) at the age of 13. He was scouted and recruited by the Turkish professional team Ьlkerspor when he was a teenager. He became a member of the national basketball team of Georgia at a young age and led his team as a center to beat other Eastern European rivals, such as Belarus and Bulgaria. This helped him to gain the respect and love of Georgian basketball fans. After distinguishing himself in Ьlkerspor squad, Pachulia was drafted in the second round by Orlando Magic in 2003 NBA Draft. Zaza ended up spending the 2004-2005 season with the Milwaukee Bucks. The Bucks did not have a contract with Pachulia, because he was traded from the Charlotte Bobcats, where he was selected in the 2004 expansion draft. While with the Bucks, Pachulia averaged 6.2 points and 5.1 rebounds per game off the bench. After spending one season with the Bucks, the young team of Atlanta Hawks became interested in him. 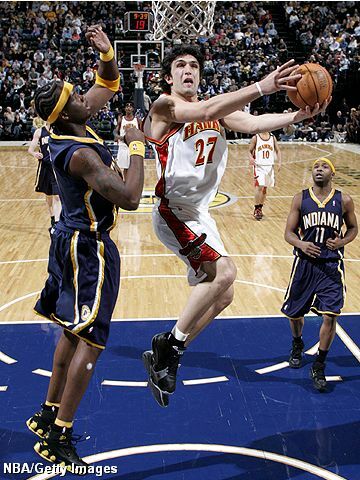 Pachulia signed a contract with the Hawks in the 2005 off-season. In the 2005-2006 season Pachulia became the starting center for the team; he averaged 11.7 points and 7.9 rebounds per game.